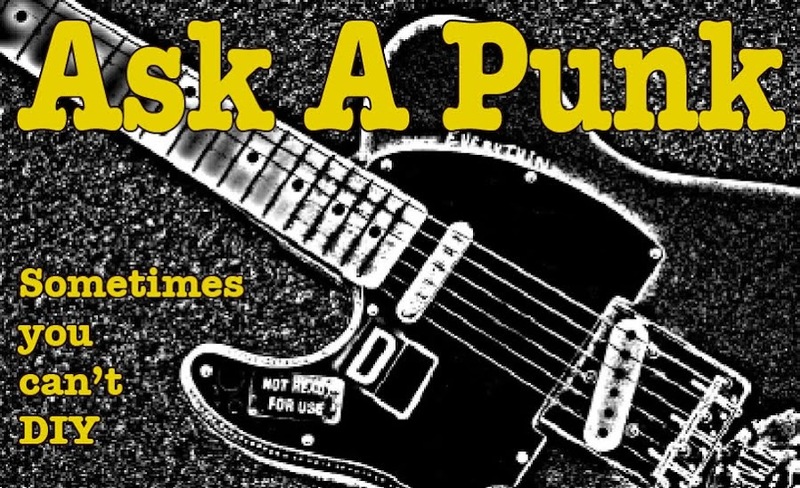 Ask A Punk: To the End, To the End, I'll Journey to the End. To the End, To the End, I'll Journey to the End. This is going to be the last Ask A Punk post for the forseeable future. Blogger spellcheck is telling me that "forseeable" isn't a word ...but then again, it is also telling me that "spellcheck" isn't a word. I started AAP in January of 2008. Now, over three and a half years, 182 posts and nearly a quarter million words later, it is time to reflect and reconsider. 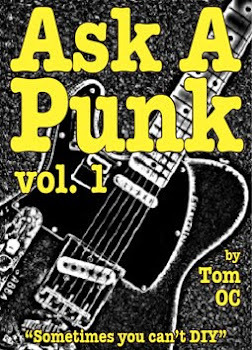 The good news is that I have the opportunity to turn 'Ask A Punk' into an Ebook. The bad news is that the few hours in the week I had to dedicate to this website will now have to be spent working on the Ebook and so, well, something has to give. I won't be taking the site down or anything, so if you're a new visitor and just stumbling upon this post I'll say - hello & welcome, please look around and read as deep as you like. I'm proud of what I did here, every Wednesday for 182 weeks (not one missed deadline!) and I hope I helped, or at the very least entertained some people. I appreciate the loyal weekly visits of all of my regular readers (numbering in the 100s.) I knew you were out there, my 'Google Analytics' reports told me so. 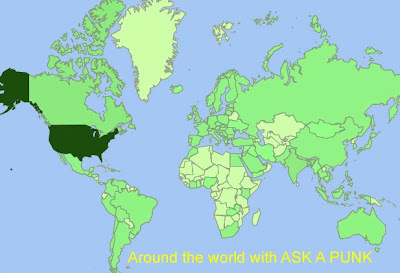 So a special thank-you to you folks in Minneapolis, Austin, Lynnfield, Portland, Seattle, Dublin, Sydney, Varanasi, Toronto, Rio de Janeiro, London, Manchester, Leeds, Ulster, Perth ... well, I can't name them all, but all told, thousands visitors and 100s of regular readers from 98 countries/territories including all 50 US states. I appreciate every moment you spent on the site. Maybe to some web-savvy folks, a few hundred readers doesn't sound like much but to me it is. I never advertised, promoted or otherwise 'pushed' this website. Maybe I should have, but I didn't. So everyone who read my posts week after week did so after discovering it for themselves and then deciding to stick around. That's pretty cool. Thanks for all your questions and supportive emails and comments. Thanks also for the flames, they made some of my weeks a bit more interesting. Egods. I'm getting maudlin. It isn't really a big deal. Just another blogger needing a break after nearly 4 years of weekly deadlines (for no money.) As I said, I'm leaving the site up and will still be regularly checking for messages at the email address. I reserve the right to come back and start answering questions at any point in time. ...so you've been warned. ... and lord knows, when/if I get the Ebook compiled, edited down, formatted and out into the world, I'll spend some quality web time flogging the heck out of it. That's it for now. Stay punk. Stay alive. ...and remember to pull your brothers and sisters out of the pit when they need help.